Devils Tower National Monument, named a "top 10 ecotourism destination," is America's first national monument. The monument was established in 1906 by Teddy Roosevelt. 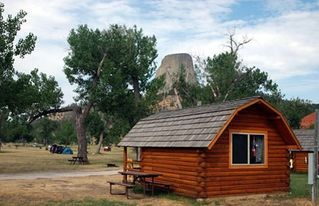 Nestled on the banks of the Belle Fourche River in the beautiful Black Hills of Wyoming, this KOA campground lies in the shadow of Devils Tower. Enjoy the nightly hayride through the historic Campstool Ranch, one of the oldest ranches in Wyoming. The movie, Close Encounters of the Third Kind, was filmed on - site in 1976, and it is shown nightly at the campground. This KOA offers a full-service restaurant, an extensive gift shop and a Sweet Shoppe that features legendary fudge and hand-dipped ice cream. Open May 15 - October 15 (depending on snow conditions, please call for off-season reservations). Pool: June 1 - September 1. Max pull thru: 70 feet. Your hosts: the Driskill family.